Obama energy secretary launches nonprofit – Ernest Moniz, who taught physics at the Massachusetts Institute of Technology for decades before becoming energy secretary in 2013, is heading up the Energy Futures Initiative (EFI) along with two high-level staffers from his time at the Department of Energy (DOE) – Moniz seemed to do well as energy secretary for Obama. An educated man who knows energy from an academic and political standpoint. Thank you Moniz. Panasonic HIT solar module achieves world’s best output temperature coefficient – standard silicon solar cell’s output temperature coefficient is -0.50%, which denotes a decline of 0.50% in the conversion efficiency as the module temperature rises by 1°C – Panasonic Corporation has achieved the world’s leading output temperature coefficient for mass-produced silicon photovoltaic modules, at -0.258%/°C. 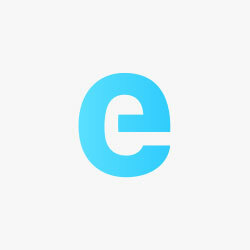 – This is cool. They’ve almost cut in half the efficiency losses associated with heat. I never even knew this type of research was going on. I expect to see other manufacturers do the same soon. The Many Fates of Former Solar Decathlon Houses – Since 2002, over 160 collegiate teams have participated in the U.S. Department of Energy Solar Decathlon. Their houses—now located throughout the United States and around the world—continue to serve numerous education-, conservation-, and community-oriented functions. – I would totally live in one of these. EU Commissioner proposes EU wide Climate Tax – As a result of Brexit and because of many new tasks the EU budget will be missing € 25 billion. EU Budget Commissioner Günther Oettinger, therefore, wants to introduce new revenues for the EU in form of a climate tax. – The issue I see here is that I’m not sure what the climate change money will be used for. We need build new infrastructure – not collect money to pay rent on buildings or salaries of politicians. If polluters are forced to pay something – they’ll refine their pollution, to a point. They won’t build clean infrastructure though. Public opinion on renewables and other energy sources – Fully 89% of Americans favor more solar panel farms, just 9% oppose. 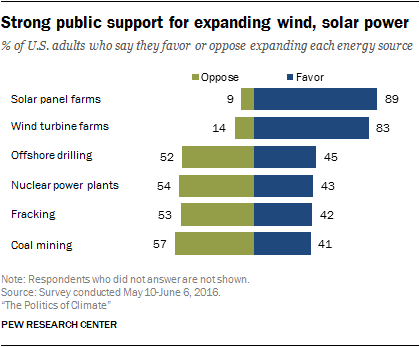 A similarly large share supports more wind turbine farms (83% favor, 14% oppose). – It’s not new news, it’s from October. But it came up in a discussion and I’ve never posted it here – so check out the below image. Large chunks of society support wind/solar. The dynamics start to evolve when we talk about how people wish to support solar. Some want the market – other wants government incentives, but at least we can come together on something. New Best-Practices Guide for Photovoltaic System Operations and Maintenance – PDF – Just a nice document for anyone wanting to know how to take care of a large-scale (or getting an idea of home support) solar power system. The document linked to here is the short version – this link – is the long version (I forwarded it to my boss cus we might learn something). Yes, I am an NREL fanboy.